Wednesday June 17th 1925 Was up in forenoon but in bed after dinner. I had two letters from Lydia that I sent to Cousin Jen. I wrote to Lydia and L D L. Ott & Fannie here in the evening. Thursday June 18th 1925 I knit some on bead bag in forenoon and wrote to Mattie Stitt. Cora to meeting in afternoon. Hattie home on PM train. She and I spent evening on the porch. Rob & Cora down town. Letter from W B Mc---. Friday June 19th 1925 I was working on bead bag part of the time and rested in PM. We took a ride after supper and were at Otts a little while. weather rather warm Saturday June 20th 1925 I rode down town with Rob in the morning and waited in Otts office for the bank to be open. I came home in taxi, worked some on bag. We rode after supper. 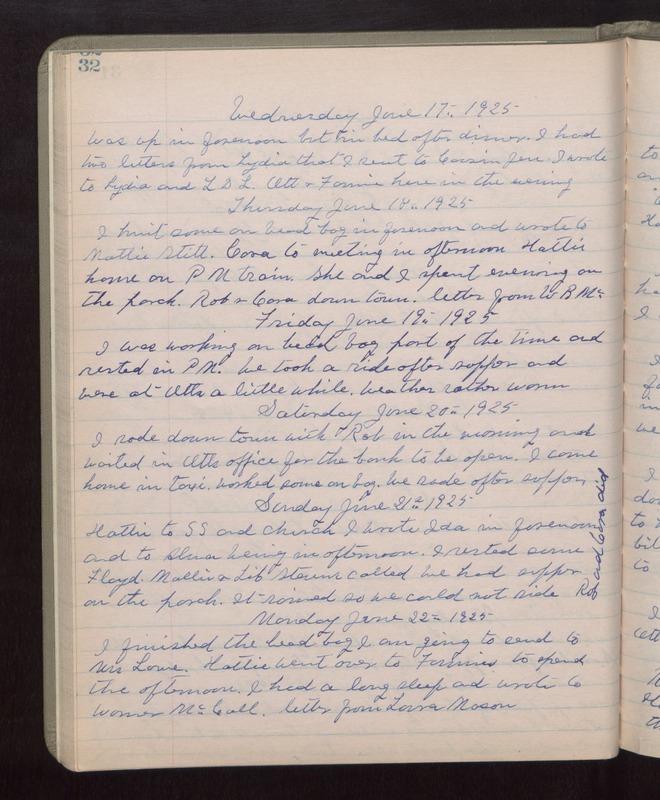 Sunday June 21st 1925 Hattie to S S and church. I wrote Ida in forenoon and to Alma Wenig in afternoon. I rested some. Floyd, Mollie & Lib Stevens called. We had supper on the porch. It rained so we could not ride. Rob & Cora did. Monday June 22nd 1925 I finished the bead bag I am going to send to Mrs Lowe. Hattie went over to Fannies to spend the afternoon. I had a long sleep and wrote to Warner McCall. Letter from Laura Mason.